Pride Parades in London, Toronto, Madrid, and Paris this year attracted millions of participants, and concern for the plight of oppressed gays and lesbians in ultra-homophobic countries was high on their agendas. 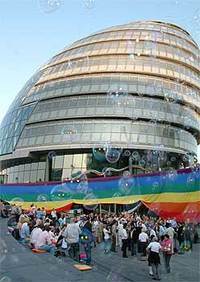 Livingstone had London’s ultra-modern City Hall (photo left) draped in a huge rainbow flag to mark London Pride, and had his own special bus in the march decorated with rainbow flags, bows, and balloons. In his remarks to the Pride rally, Livingstone -- who appeared on-stage with his two small children -- used his remarks to underscore the plight of LGBT people in other countries. “This has become a good city for people of a different sexual orientation to live in.--we follow places like San Francisco and Copenhagen and Amsterdam -- but let's never forget these are just a few secure, isolated areas, in a world still awash with bigotry and hatred,” the mayor said. 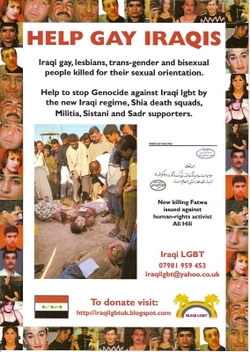 Hili added that, “I had a very warm welcome from Mayor Livingstone, who spoke about the terrible situation that his government and the U.S. government caused because of the awful and illegal war in Iraq.” Livingstone promised to take up the issue of the terror campaign against Iraqi gays, Hili said. 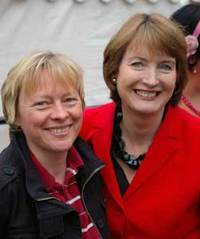 The London Pride rally was also addressed by two members of the new British government headed by Labour Party Prime Minister Gordon Brown, successor to Tony Blair. But doubts have been raised about new Prime Minister Brown’s commitment to full gay equality by gay rights campaigners and the gay press. As the Toronto Pride Parade made its way down Yonge Street -- the main street in the city’s gay neighborhood -- in the lead as Grand Marshal was the co-secretary of the International Gay and Lesbian Association, Rossana Flamer-Caldera (left), an LGBT activist from Sri Lanka. Flamer-Caldera was co-founder in 2004 of the Sri Lankan LGBT group Equal Ground, which held its own four-day Pride festival this year from May,.20-24, including the country’s first-ever LGBT film festival. Sri Lanka, where homosexuality is a crime punishable by ten years in prison, was one of eight countries which Toronto Pride organizers decided to highlight this year because queers face persecution there in the form of denial of civil liberties, torture, imprisonment, or the death penalty. Representatives of gays in Iran, Pakistan, Nigeria, Belarus, Russia, Jamaica, and Honduras -- each carrying their country’s flag -- were invited to lead the Toronto Pride Parade right behind Sri Lanka’s Flamer-Caldera. 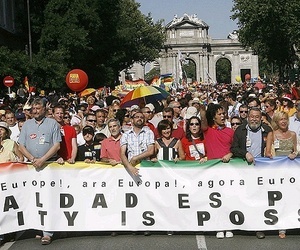 The theme of the Madrid EuroPride was “Europe Now --Equality is Possible,” and the parade, which made its way through the middle of Spain’s capitol city, featured 45 floats, including entries from Manchester, Marseille, and Zurich, and organizers said that some 200,000 people from all over Europe had come to Madrid specifically for the event. Madrid had been chosen for this year’s EuroPride in recognition of the pro-gay reforms introduced by the government of Socialist Prime Minister Jose Luis Rodriguez Zapatero (Right). Earlier this year, Spain passed a law that will allow transsexuals to change their name and gender without undergoing gender reassignment surgery. 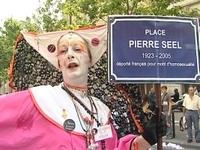 “We have to defend our rights as gays, and from Spain we are going to proclaim loudly that these rights can be achieved everywhere in Europe," said Antonio Poveda, 39, president of the FELGBT, Spain's Lesbian, Gay, Transsexual and Bisexual Federation (logo left), who singled out Poland and Russia as two European countries that persecute homosexuals. Several groups in the parade carried banners saying, "Poland, stop homophobia. For a European Union free of discrimination," "Next EuroPride in Poland," and "Watch out for the German shepherd" next to a photograph of Pope Benedict XVI. Zapatero’s government was represented in the parade by Minister of Culture Carmen Calvo (left), who told Agence France-Presse, “We are very proud to receive the rest of Europe. Today Spain is an example of advanced democracy. We must fight homophobia and reactionary attitudes." The heads of Spain’s two major trade union federations also took part in the march. 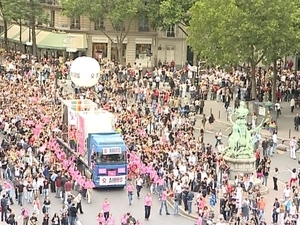 In Paris last Saturday, 500,000 people turned out for the Marche des fiertés, a Pride parade led by openly gay Paris Mayor Bertrand Delanoë, the radio network Europe 1 reported. 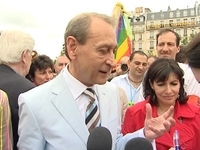 Paris Pride’s slogan this year, “No Compromise on Equal Rights,” was addressed to newly-elected conservative President Nicolas Sarkozy, who opposes both gay marriage and gay adoptions. 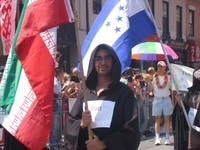 The Pride parade included delegations from the major trade union federations, and from a coalition of groups favoring more liberal asylum policies for refugees from sexual persecution in homophobic counties (at left). Support GLBT Rights! 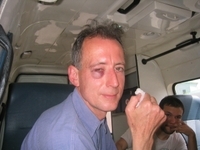 Fight those that stone gays to death! Democracy NOT Theocracy! 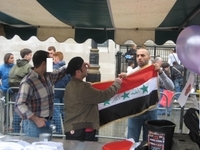 STOP KUFFARPHOBIA Demo in London, Friday 10/26/07!